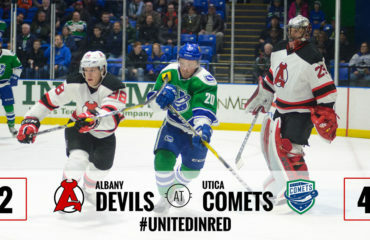 UTICA, NY – The Utica Comets shut out the Albany Devils as the Devils fell 3-0 Saturday at Utica Memorial Auditorium. 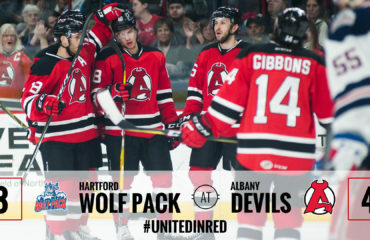 The Devils record moves to 32-25-1-1. The Comets improve their record to 25-23-7-2. 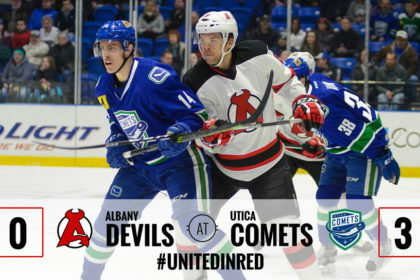 After a scoreless first period, Jake Virtanen got the Comets on the board at 8:00 of the second period with a shot from the slot that slipped under the crossbar. Evan McEneny and Cody Kunyk picked up the two assists on the play. Wacey Hamilton put the Comets ahead by 2 at 12:05 of the period when the puck found him at the top of the crease after a scramble in front of the net. Colby Robak and Ashton Sautner were credited the assists. 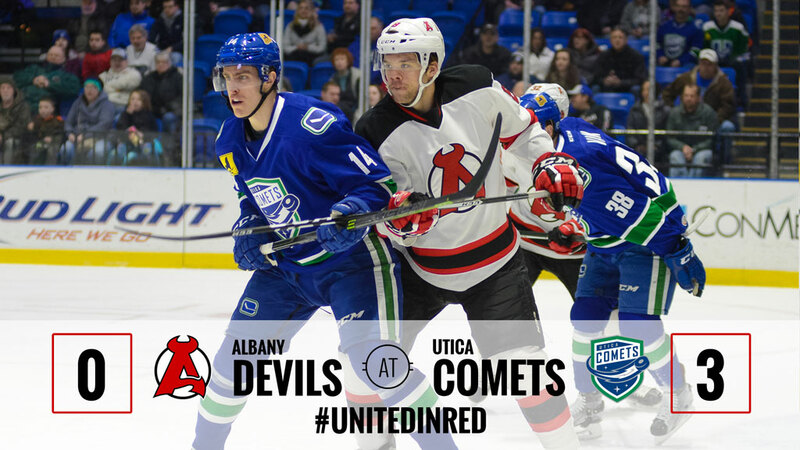 Borna Rendulic sealed the Comets 3-0 victory at 7:02 of the third period. Mike Zalewski and Chad Billins earned the two assists. Mackenzie Blackwood turned aside 25 of 28 shots and moves his record to 11-10-2. Thatcher Demko earned his first career shutout with the victory, stopping all 38 shots he faced. His record improves to 13-11-4. 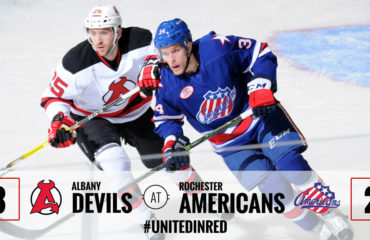 The Devils travel to take on the Binghamton Senators Friday for a 7:05 pm face off.